Not only does salmon go great with Caesar salad, but it is also a protein packed and low carb meal if you are watching your weight. It is best if you smoke your salmon ahead of time and slice some off for a salad the next day. Since this recipe calls for a pre-smoked salmon in order to reduce the time to prepare this salad. If you need to learn how to smoke the salmon, visit our cedar plank smoked salmon recipe. 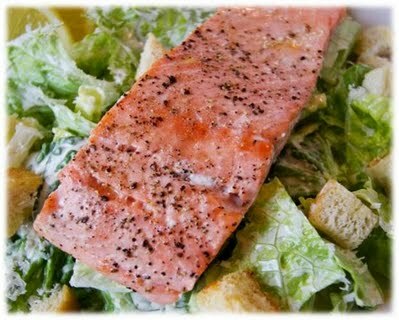 Once you smoke your salmon you can refrigerate the leftover salmon and it will be cold for this Ceasar salad recipe. If you already have the salmon ready, this recipe only takes about 5 minutes to mix everything together so it is a great meal if you are short on time. Another convenience tip is you can simply purchase a Caesar salad package that will have all of your ingredients except for the smoked salmon. Simply mix all of the ingredients together in the package along with your salmon and you are ready to serve. If you prefer to make the Caesar salad yourself, below are all of the recipe ingredients you will need along with step-by-step directions. Cut your tomato, olives, and lemon into slices. If you like to serve your salad with the dressing mixed in, place all of your ingredients in a large bag or bowl and mix everything together including the Caesar salad dressing. If not, you can mix all of your ingredients in a serving bowl and put the dressing on the side.